I’m trying to continue journaling this experience but honestly it is difficult. Sometimes I’m finding myself sitting in silence feeling as though what is happening is not real. I just wanted to write a book that people would want to read. Because the theme of Road of Ash and Dust (ROAD) deals with self-awareness, psychological and spiritual growth I wasn’t sure it would gain any traction. The books that I see doing amazingly well deal with really salacious themes and intrigue. 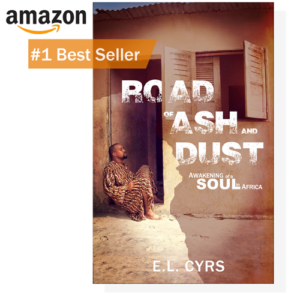 Road of Ash and Dust is truly the antithesis to the current popular themes in publishing. For the past 48 hours my book has ruled the top spot of rankings in biography and memoir on Amazon, specifically #1 in African-American memoirs. The other categories that ROAD has held the the top spot are #1 in the Social Sciences (African-American Studies), #1 in Travel (Africa) and #4 in Travel Memoir Books (Travelers & Explorers). My jaw dropped when I found out that ROAD took the #1 spot, not only in the United States, but also in the United Kingdom. In Great Britain Road of Ash and Dust has held the #1 spot for more than 48 hours in Biography and True Accounts (Ethnic and National) and the #2 spot in Society, Politics and Philosophy (Black Studies). My book is doing well in Great Britain? Wow! As I write about the success of the book I feel like I’m writing about someone else. The feeling is surreal. Something I am really surprised about is that all of this is happening during election day here in the United States. People are still buying books on election day! That is extraordinary to me. I don’t know where this may lead in the future as far as my book but I do know that, regardless of what happens, I will continue writing. I don’t know if I speak for any other writers out there when I say that the thought of hundreds or thousands of people reading and enjoying my manuscript provides me with so much joy. Yes, the money that the book can potentially make is important but there something about readers finding value in your words that is a phenomenal sensation.